Nobody likes getting sick; certainly not me! I had much to do at work, and plans that I would've loved to keep. Still, I suppose a wicked head cold is tolerable, under the right circumstances. Once you get past that gross first half hour of the morning, and the occasional sneeze-fests, the best thing to do on a day (or two) on the couch is to take advantage of the situation. This I do by catching up on some reading, and on some tea drinking. My favorite tea ritual on a sick day is to throw a few older loose teas together, maybe sweeten with some honey, and see how it goes. I haven't lost my sense of taste, but it does diminish, so instead of wasting my new packets from Upton and David's Tea, I finished off a Darjeeling, combined with an ancient vanilla rooibos, tossed a bit of herb sin, and voila! A mildly caffeinated, still tasty and comforting blend. I've had some failures in the past, but this is where the honey comes in. Either way, it's a perfect soothing answer to my dulled senses - and a good use of teas I'd never serve to company. With this extra time, once I'd grown tired of napping, I finished something else off: a good book! This was by no means stale, though I have to admit I was glad to see the end of it. My selection was Elizabeth of York, by Alison Weir. I loved Weir's biographies of Eleanor of Acquitaine and Elizabeth I, and some of her historical novels. Some recent biographies I wasn't so crazy about, as they were too speculative, as is necessary perhaps when writing lives of women in Medieval/Renaissance times. Women weren't considered as worthy of note by their contemporary writers, and few kept writings of their own unless they were of the nobility, and even then it was usually formal letters and accounting records (as is evident in Elizabeth of York.) Still, this was an intriguing time to read about. In case you're not sure, Elizabeth of York is the daughter of Edward IV, the dashing Yorkist king who made an unpopular marriage to someone considered beneath him. This same wife (Elizabeth Wydeville) did a good job providing him with heirs - two sons and an even more daughters, of whom Elizabeth was the eldest. She did a really good job getting high positions for her relatives, which did not help matters. When Edward IV died after a short sickness, his son, Edward V-ish, was taken into 'protective' custody by his uncle Richard, and his maternal relatives were either executed or exiled or in sanctuary. Elizabeth spent many anxious months in sanctuary with her mother and sisters, though her other brother Richard joined Edward V in the Towe. They disappeared, possibly killed at the order of their uncle, who was now Richard III. Of course, that's a famous controversy, and Weir is firmly of the belief that he was responsible for their murders. He was certainly guilty of claiming Elizabeth and her sisters were illegitimate, since Edward IV had been betrothed to another woman - doubtful, but it stuck for the moment. So her future was uncertain until Henry Tudor made his way over to England, gained victory over Richard III at Bosworth, and became Henry VII. His claim to the throne was a bit shaky, and his marriage to Elizabeth helped to solidify his new-founded dynasty - which was kind of a sticking point for him. Even so, their marriage was actually the most successful of all the Tudors. Weir's theme, it seems to me, is that Elizabeth wasn't tragically undermined by her husband or mother-in-law, Margaret Beaufort, as many writers have implied. However, she must have been uneasy at times, what with all the young men coming forward pretending to be her brothers or someone else close to the throne. It's not a bad subject. So much has been written about Elizabeth's son and his wives (I'm sure you can figure out who I'm talking about - eight guesses! ), and it's good to have a little light shed on this transitory period. Being that I'm bleary-eyed (back to the head cold again), it helped that it was a large-print book. I see just fine with my glasses, but I'd checked this book out from the library, not realizing which edition I'd selected. My only real issue is that there were too many details that were unnecessary. How many times do I need to know everybody's salary, and every bit of garment and wall hanging of the period? Also, in her book, The Princes in the Tower, she made clear her belief was that Richard III was the guilty party, so in Elizabeth of York there's no room for argument. Don't know why I want Richard to be innocent in this - he's not even the Richard that David Tennant's been playing, so what's my problem? Pairing: if you're healthy, I'd recommend Tower of London tea by Harney and Sons (ha) or a Rose blend - for the York and Lancaster factions, of course. Since Henry VII had a reputation for being a miser (and Alison Weir had points against that, too), my old-tea Sick Day blend is just the thing for those stuffy days. So, in short, it was a biography of Henry VIII's mom? What years did she live? 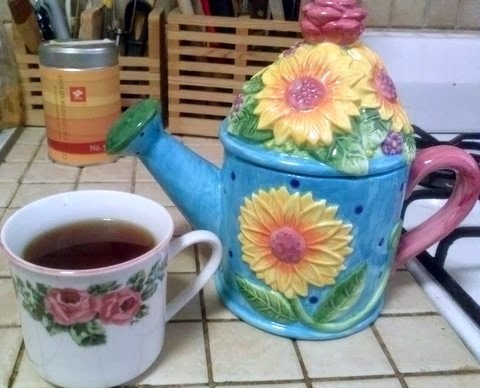 Your teapot and cup were very cheerful. Decaf mango flavored HEB brand tea awaits you in SA! Bon, she lived in the late 15th to early 16th Century. She died on her 37th birthday, after childbirth. Their methods of midwifery were not exactly sterile.